A 98th minute penalty from Jordan Cox saw ten-man Canvey Island earn a point in a rollercoaster of a match at The Frost Hire Stadium that finished 2-2 in the Bostik North. With manager Danny Heale away, assistant Brad Wellmen made one enforced change from the side that had beaten Maldon & Tiptree a week earlier, with George Allen coming in for the injured Jake Jolliffe. There were plenty of familiar faces in the opposition ranks, with ex-Gulls Tony Stokes, Albert Levett and Ayrton Coley in the starting XI and defender John Easterford on the bench in his new role as player/assistant manager with the Blues. Two pieces of good fortune nearly saw Canvey take the lead in the fourth minute. Firstly the ball struck referee Rhys Battye inside the Brentwood half, and in doing so the ball fell straight to the feet of Jose Figura. The midfielder ran until 25 yards from goal and hit a low shot which skidded off the slippery surface. Goalkeeper Rob Budd dived low to his left and got contact on the ball but allowed it to squirm through his hands, but the touch he did get was enough for the ball to squirm past the post for a corner. 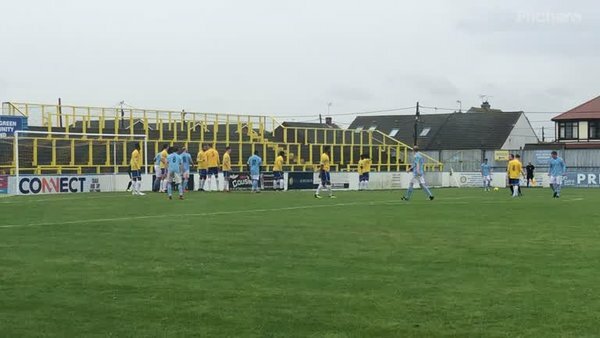 There was almost another lucky goal for Canvey four minutes later when Frankie Merrifield crossed from the left deep to the far post, going over Rob Budd and glancing off the crossbar. Brentwood created their first chance soon afterwards when Ayrton Coley was played through the Canvey defence onside, but Harry Palmer did brilliantly to come off his line and keep the shot out with his left leg. The game slowed slightly after an energetic start, but it wasn’t long before the Gulls were back to creating chances. On 22 minutes Mitchell Gilbey had a curling shot from 20 yards go over the bar after a good advantage from the referee, and five minutes later George Allen had an under hit effort blocked by a defender after a clever corner routine. 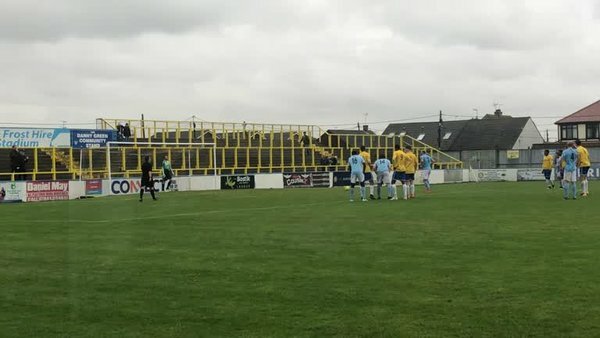 Canvey had the ball in the net on 32 minutes when Jordan Cox got his head on the end of a cross by Marlon Agyakwa from the right, but the assistant referee’s flag was raised for offside to chalk off the goal. The two sides then took turns working the goalkeeper, with Harry Palmer tipping a free kick from Kojo Apenteng wide on 34 minutes before Mitchell Gilbey had a shot saved by Rob Budd two minutes later after a through ball from Jordan Cox. Brentwood had a golden chance to break the deadlock on 39 minutes when the ball was worked over from the left to the far post and found right back Jack Gardner, but hit goalbound effort was prevented from hitting the target thanks to a tremendous last ditch sliding block by Jordan Brown. This block proved to be vital three minutes later when Canvey got their noses in front. The goal was identical to the one they had ruled out earlier in the half, but this time the flag stayed down as Jordan Cox headed home a good cross from Marlon Agyakwa. Canvey’s lead didn’t last long, as two minutes into the second half the visitors were level. A cross from the left found Tony Stokes at the back post, and after a neat flick to put the ball onto his favoured left foot the forward shot low across goal and into the bottom corner to equalise. They came close to taking the lead nine minutes later when they were awarded a free kick on the right wing just outside the area. Left back Luke Foster curled the dead ball across goal but saw his effort cannon off the crossbar with the keeper beaten. Having scored twice a week earlier, Josh Hutchinson had a great chance to hit the back of the net once again on 57 minutes when he was played into the box. Hutchinson ran the ball towards goal but struck a low effort straight at Rob Budd who was able to make the save. The game was tilted in Brentwood’s favour on 72 minutes when George Allen was dismissed for a second bookable challenge. Having been shown his first yellow card 20 minutes earlier, Allen was deemed to have challenged for a bouncing ball with his studs showing and was duly given his marching orders. This gave the visitors the incentive they needed to crank up the pressure, with Alfie Hilton forcing Harry Palmer to tip a cross over the bar less than sixty seconds after play had restarted following Allen’s sending off. With the Gulls under pressure, substitute Sam Collins nearly put Canvey back in front on 84 minutes when he launched a remarkable effort from 30 yards that headed to goal like a missile, thumping the underside of the crossbar and bouncing down inside the six yard box. Brentwood were awarded a penalty on 88 minutes when a ball into the box from the right was punched away from goal by Harry Palmer. However, the keeper didn’t make great contact on his punch and dragged back Tobi Joseph to prevent the forward from taking advantage. Ex-Canvey midfielder Albert Levett stepped up and sent Palmer the wrong way from the spot to seemingly win the match for his new employers as the match ticked over into stoppage time. There was, however, one last twist in the tale to round off a dramatic match. 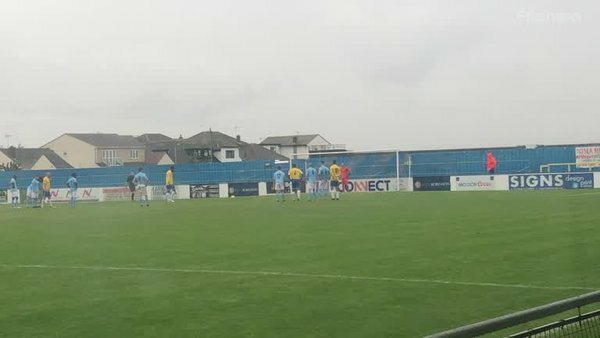 A ball through the Brentwood defence was latched onto by substitute Martin Tuohy, and in attempting to round Rob Budd he was brought down by the keeper for another penalty on 95 minutes. There was a four-minute gap between the penalty being awarded and being taken as Albert Levett received treatment for cramp, cranking up the pressure on taker Jordan Cox. However, he was able to keep his cool and slammed home from the spot to secure a point with virtually the last kick of the match.